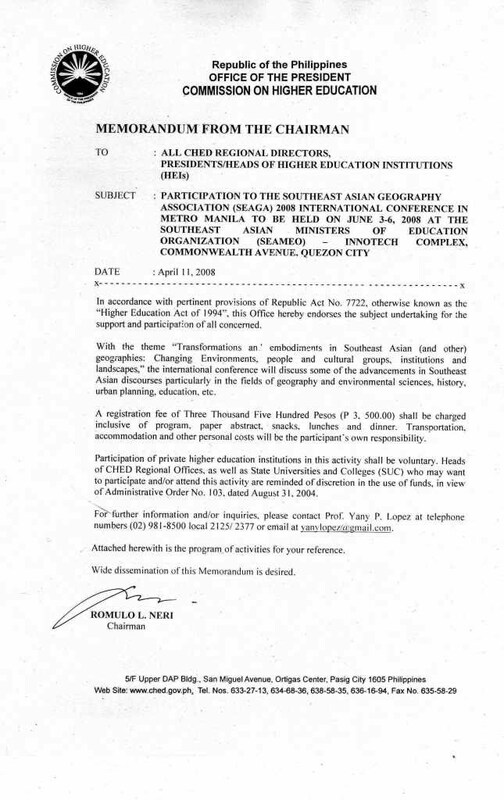 The SEAGA 2008 International Conference is endorsed by the Commission on Higher Education (CHED) of the Republic of the Philippines. Fish disappears from stressed coral reefs as the Philippine government suspends some shady business transactions and deals with terrorism. Cambodian officials hope to build more ties with Vietnam as Angkor Wat tourism and local officials find ways to protect this heritage site and make the industry sustainable. Martial Law is continuously imposed in some parts of Thailand to crack down on drug dealers and other illegal activities. In the meantime, not much is known on the challenges that are faced by thousands of monks as they clamor for more democratic spaces in Myanmar. Natural cycles, environmental fluctuations and human activities, which are intricately woven around economic, cultural, environmental and political concerns, have always characterized the trajectories of transformations of the world that we live in. Together, they have influenced the directions and altered the pathways, trends and outcomes of earth cycles and environmental vacillations. The usual reversible or irreversible outcomes are increased rates of soil erosion, desertification, widespread deforestation, habitat loss, species extinction, and pervasive water, air and land pollution. The short- and long-term manifestations of earth systems’ modifications are borne by the numerous environmental landscapes and human societies belonging to diverse cultural groups. The economic and political circumstances of some privileged cultural groups buffer them from the negative consequences of these ecosystems’ transformations. The under-represented and more economically marginal ones often lack the resources to buffer themselves from the negative impacts of environmental transformations and, thus, suffer pervasively and repeatedly. Moreover, they do not get the assistance of institutions which are mandated to address the complexities of their problematic everyday conditions. However, these institutions are also characterized by problems such as misallocation of limited resources, mismanagement of development programs, and in some cases, insensitivity to the primary and basic concerns of the underprivileged cultural groups. In the midst of intertwined and globalizing economic and political processes, the present and future conditions of their natural environments and social, cultural and political landscapes change. These corresponding trails and trajectories of environmental changes and the associated and resulting human conditions are widely observable in Southeast Asia. They are intricately embodied in the daily experiences of the indigenous peoples, rice paddy farmers, sidewalk vendors, housewives, schoolchildren, entrepreneurs and young urban professionals of Thailand, Vietnam, East Timor, Malaysia, Singapore, Laos, Myanmar, Cambodia, the Philippines, Brunei and Indonesia. They are closely woven in the everyday survival conditions of informal settlers and interlaced in the economic circumstances of upbeat information technology specialists in Manila, Singapore, Kuala Lumpur, Hanoi, Jakarta, Bangkok, Phnom Penh, Bandar Seri Begawan, Vientiane and Rangoon. They define the order, stability and direction of the evolving economic processes, political struggles, cultural expressions and social relationships that may have local, regional and global significance and repercussions. Meanwhile, it remains that the processes and changes have unequal impacts among human societies and environmental systems in different parts of the world. Nevertheless, as members of humanity, we will altogether suffer the consequences of these local, regional and global transformations in the very near future.